Everybody has a Tiger. It is the thing that snarls at us when we think about making a change in our lives and stops us developing and achieving our potential. 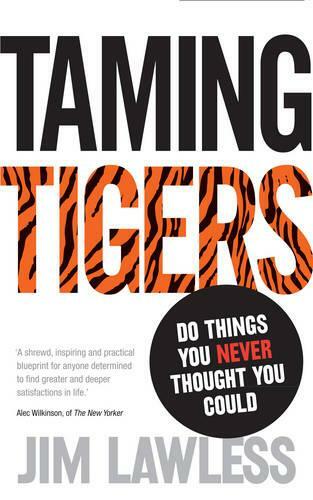 In Taming Tigers Jim Lawless shares his proven and inspirational training programme to help you achieve your dreams by taming the Tigers in your life. Now for the first time, you can learn how to use these highly practical rules to overcome your fears and do things you never thought you could - in both your professional and private life. 1.Act boldly today - time is limited 2.Re-write your rulebook - challenge it hourly 3.Head in the direction of where you want to arrive, every day 4.It's all in the mind 5.The tools for Taming Tigers are all around you 6.There is no safety in numbers 7.Do something scary everyday 8.Understand and control your time to create change 9.Create disciplines - do the basics brilliantly 10.Never, never give up! Read case studies from people who have changed their lives by following the rules, and hear about Jim's experience of grabbing his own Tiger by the tail, as he went from a thirty-six-year-old overweight non-riding consultant, to a fully-fledged jockey and UK freediving record holder in 12 months - proof that Taming Tigers works! A truly motivational read that made me laugh, cringe and get breathless with possibility... a wonderful, wonderful book that you won't want to put down.